Atwater | Beer Apprentice - Craft Beer News, Reviews, Interviews and Info. Hello everyone. 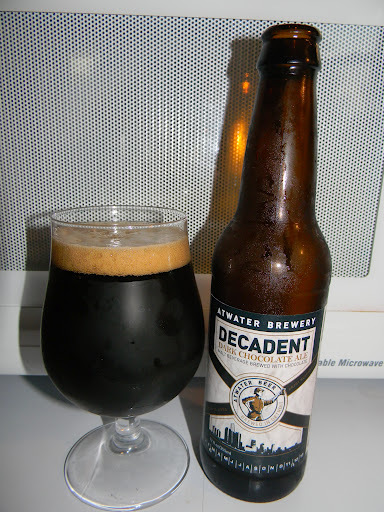 For today’s craft beer review I’m going to be trying the Decadent Dark Chocolate Ale produced by the Atwater Block Brewery located in Detroit, Michigan. As I’ve mentioned numerous times before, I really enjoy “chocolate” beers, so I’m extremely interested to see how this one stacks up to some of the others that I’ve had. I couldn’t find any information about this beer from the website, atwaterbeer.com, or anywhere else on the web for that matter, so we are just going to have to pour it and see for ourselves. This brew came in a 12 oz. bottle, however I have no idea what the ABV is. It poured a super dark brown/black color with absolutely no highlights. The head was khaki colored, very smooth, creamy and soft. The size was decent, but the retention time was only average. The lacing was a little thin as well. The fragrance smelled great. A wonderful hint of rich, dark, bitter, bakers chocolate combined with roasted grains and malts. A dried cocoa powder aroma was found as well. Very chalky and “dry” smelling. It was a bit one dimensional, although that is precisely how I think the chocolate beers should be. That’s all I want to smell when I pick one up to tell the truth. The taste wasn’t quite as rich or robust as the nose was…. or as much as I thought it might be anyway. I still received some chocolate, however it seemed to get a lot more grainy, less chalky and the bitterness started to lose it’s luster after a few moments. Hmm. Not horrible, but not what I had hoped for to be honest. The mouthfeel was a tad thin. Somewhat watery too. It was very smooth and slick though. The carbonation was medium to low and some flavor was left behind after the swallow, but not a whole lot really. Well….. the Atwater Brewery Decadent Dark Chocolate Ale wasn’t bad. It had a beautiful bouquet, but it didn’t hold up with the taste aspect in my opinion. I don’t think it’s quite on the same level as the Rogue Chocolate Stout or the Southern Tier Choklat (which are the two by which I judge all other chocolate beers), yet it still showed some of the proper characteristics for a beer of this style. It was super easy to drink and it is a beer that should be tried if you favor “chocolate” beers. Have any of you guys ever tried this? What did you think? Feel free to leave a comment if you wish.